When we came across this monogram, we absolutely fell in love with it. If only we could claim it as our own! Though our albums are filled with many lovely monograms to choose from, it is always a delight to see what kind of custom designs our customers are creating to make their stationery truly personal. The set pictured below was created for a bride who had a custom wedding logo designed for her wedding. So of course, she wanted it incorporated into her personalized stationery. Color and style, she said, were the most important details she thought about. With her custom monogram in hand, she paid a visit to Wendy of stationery shop Folia in South Dartmouth, Massachusetts. "We talked about colors and then saw that great polka dot lining, and then it all came together," Wendy said. 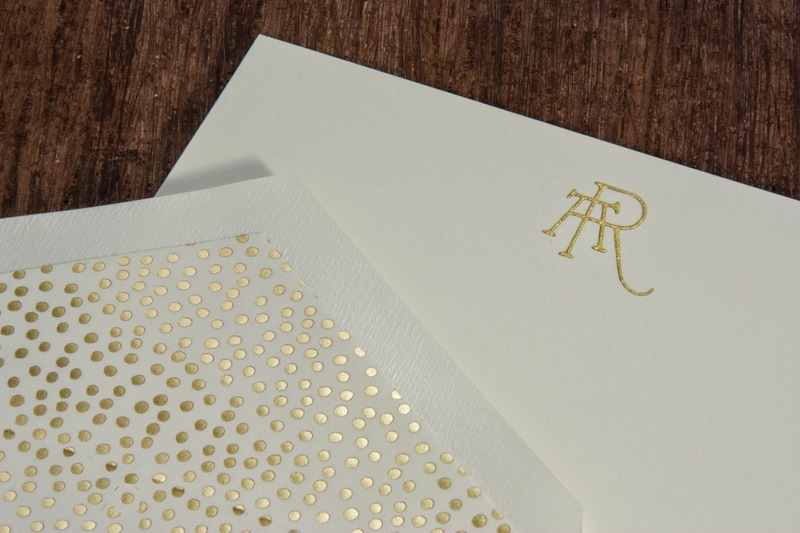 In the end, the bride chose an ecru correspondence card with her monogram thermograph printed in gold ink and paired with our confetti envelope lining. When it comes to designing any kind of stationery, there are always certain questions Wendy said she asks: Card or a fold-over note, color, style and price. And when asked what the importance of a handwritten note in a digital age is, Wendy put it quite simply: "Everyone should have personalized stationery!"